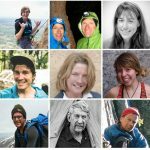 In Munich last weekend, Janja Garnbret took her second bouldering gold of the season, Gregor Vezonik his first overall, and season champions were crowned. 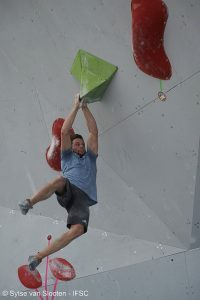 Akiyo Noguchi takes a wild swing out on W3 during finals in Munich. Photo: Sytse van Slooten. 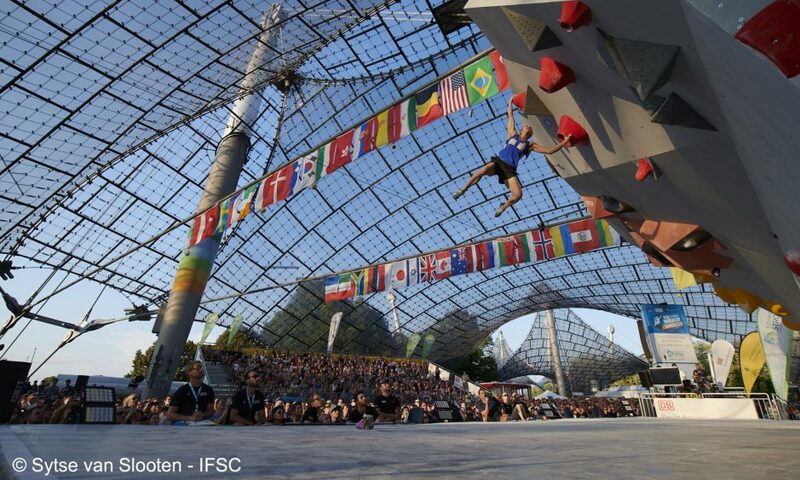 The 2018 lead queen Janja Garnbret crossed over to bouldering to take a gold in Munich while the Slovenian Gregor Vezonik won his first World Cup. 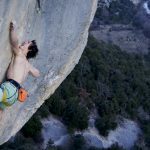 Meanwhile, Jernej Kruder and Miho Nonaka were declared overall 2018 Bouldering season champions. 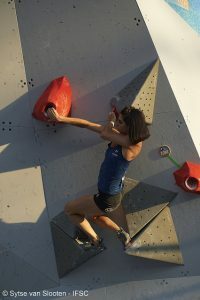 The women’s finals lineup at the 2018 season’s final Bouldering World Cup consisted of a lot of the usual crowd. Garnbret, of Slovenia, the dominator of the women’s 2018 lead season, with golds in all lead World Cup’s save for one, went into finals tied for first with Fanny Gibert of France, ranked third overall in the season standings. 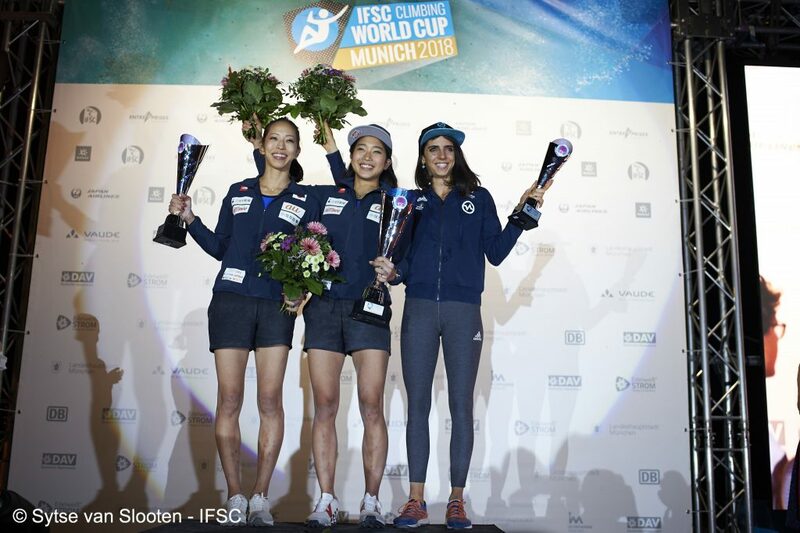 Japan’s dynamic duo and season leaders Miho Nonaka and Akiyo Noguchi, along with Katja Kadic of Slovenia and Ekaterina Kipriianova of Russia, rounded out the starting list for finals. 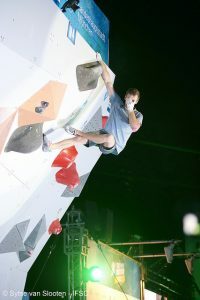 While Gibert, Kadic and Kipriianova struggled on W1 and couldn’t manage a top, Garnbret took the dynamic problem down with a flash, while Nonaka sent it in two tries and Noguchi in three. When everyone save Kipriianova managed a flash on W2, the competition started to come down to the wire. 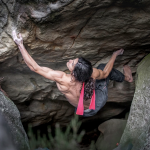 Noguchi made W3’s dynamic lateral lunge to tiny crimps on volumes on her second try, topping the problem, but both Nonaka and Garnbret latched the dyno for an easy flash and held their lead. 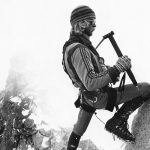 Though Nonaka was at this point behind Garnbret by a razor-thin margin of one top attempt, the most tense competition came between Nonaka and Noguchi, as one of the two Japanese climbers was guaranteed the season championship title. Noguchi, who holds claim to four past championships, needed to score a silver or gold and be ahead of season-leader Nonaka in order to clinch the title. When Noguchi made a calm, collected flash of W4, Nonaka needed a send in two attempts to place second and win the title. 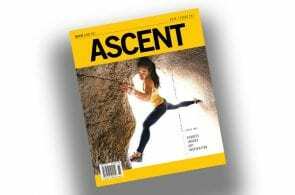 She managed a flash, taking silver and the crown of 2018 Bouldering Season Champion. Garnbret ended finals with a perfect score of four flashes on four problems, vaulting her to a fourth place season finish and her second bouldering gold of 2018. After her third place finals finish, Noguchi placed second overall by a mere five points—495 to Nonaka’s 500. Noguchi holds three 2018 gold medals, more than any other competitor. Fanny Gibert followed in third overall, with Nonaka in first. Though Nonaka has finished top five every year for the last five years, this is her first season championship. Yoshiyuki Ogata and Yuji Fujiwaki of Japan rolled out of men’s semis ranked second and first, respectively, with the Slovenian Kruder following, along with season powerhouse Jakob Schubert of Austria, Mickael Mawem of France, and then Vezonik in sixth. Kruder had the season title in the bag so long as he placed higher than Japan’s Tomoa Narasaki, and so when Narasaki didn’t make it into finals the Slovenian knew the title was his. The men’s problems proved difficult for most of the finalists. Not a single competitor reached the zone of M1 besides Vezonik, who managed a flash. Fujiwaki and Mawem fell off the boards after M2, where neither managed a zone, but Kruder and Schubert scored a top, both with eight attempts, and Ogata in ten. Vezonik couldn’t top, but held the lead thanks to his flash and a zone on M2. M3 saw Fujiwaki take a top and everyone else a zone, and then M4 led to easy flashes for all competitors save Fujiwaki, handing the gold medal to Vezonik, his first in a long career. Kruder’s performance netted him silver, while Schubert took bronze on zone attempts. 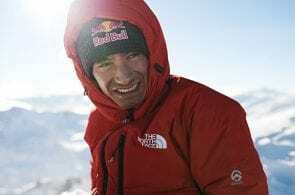 Overall, Kruder finished 42 points ahead of Tomoa Narasaki’s 400 in the 2018 season, with Japan’s Rei Sugimoto, the victor in the previous World Cup in Vail, ranked third at 334. 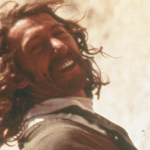 For full results, visit the IFSC’s website.